While most of the media’s focus in this election has been on Donald Trump successful attempts to burn down the GOP’s clubhouse, the Democratic Party establishment has also struggled to put out a populist fire as Democrats have tried to maintain the status quo. For now, establishment Democrats may have preserved a skeleton of the institution but we won’t really know what it will look like until after what many expect will be a contested convention in July. Sanders supporters have continuously (and rightfully) complained about a system that has been built and manipulated to protect their anointed nominee. In fact, four hundred sixty-five of the 714 superdelegates went beyond their intended utility as a last minute insurance policy to determine the outcome of a contested convention. These superdelegates went against the Democratic Party’s rules — by preemptively endorsing and campaigning for Hillary — before the primary began in the summer of 2015. They were seen as a buffer to prevent other Democratic candidates from running against Hillary. This ultimately set the stage for a Democratic nominee who appeared to have almost universal support. Hillary walked into the first Democratic debate with support from most of the federally elected Democrats in America and also the support of party leaders across the country who oversee their regions’ primary process. Yet, after running the most notable woman in recent history — someone who has the infrastructure, money, media, endorsements and years of planning behind her — how could Bernie Sanders, the most liberal man in America — give Hillary Clinton such a fight? How could this fight become one that was fueled by a dream, a collection of $27 donations and a message spread across the internet? When you look beyond the 24/7 news cycle reports, this presidential race is just a reflection of a party that’s broken down at all levels. If there’s anything we’ve learned in this bizarre election year, it’s that political institutions are not too big to fail. Despite jarring demographic splits, horrifying defeats at the state and congressional level over the past decade and unpopular tactics by its equally unpopular chairwoman Rep. Debbie Wasserman Schultz, the DNC has clung to its out-dated ‘80s era “fundraise or bust” strategy. Perhaps they did this out of fear of change or fear of the unknown or frankly, out of fear of losing their lucrative Beltway consulting contracts. No, a Democratic presidential candidate does not need to be a corporate puppet. No, a Democratic presidential candidate does not need to out-raise Republicans. No, a Democratic presidential candidate does not need to distance himself from the grassroots. Just remember, the only candidate in this race who consistently beat Republicans — across the board — all while mobilizing new voters was Bernie Sanders. Democrats can no longer keep their blinders on. Despite having raised record amounts of money, the DNC’s strategies are flawed and ineffective — as evidenced by the loss of over 1,000 seats from the local to the national level since 2008. At a time when the country is becoming more open to liberal policies and when the Democratic Party membership is 70 percent more progressive than it was 10 years ago, more and more progressives are still leaving the party. That means it’s time for reform. 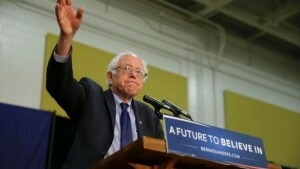 Bernie Sanders has revolutionized the Democratic model of presidential campaigns. But that’s not all he’s done. Through a citizen-funded campaign he has electrified the base and attracted disaffected, first time voters and the much needed independents back into the party — all while being honest, courageous and transparent. These are the prescriptions that the Democratic Party needs to take to rebuild itself from the ground up. There is much reform and debate to come at what many expect will be a contested convention in July. The political revolution has just begun.